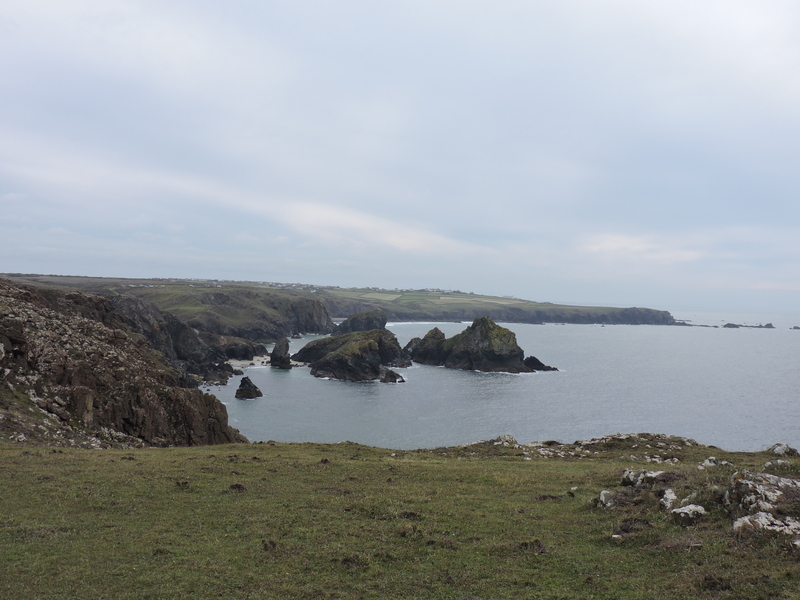 Yesterday we went back to Predannack and across walked to Kynance Cove which has become a favourite circular walk for us. After torrential rain all day on Thursday, it was pretty wet! But despite grey clouds it didn’t rain on us during the walk. 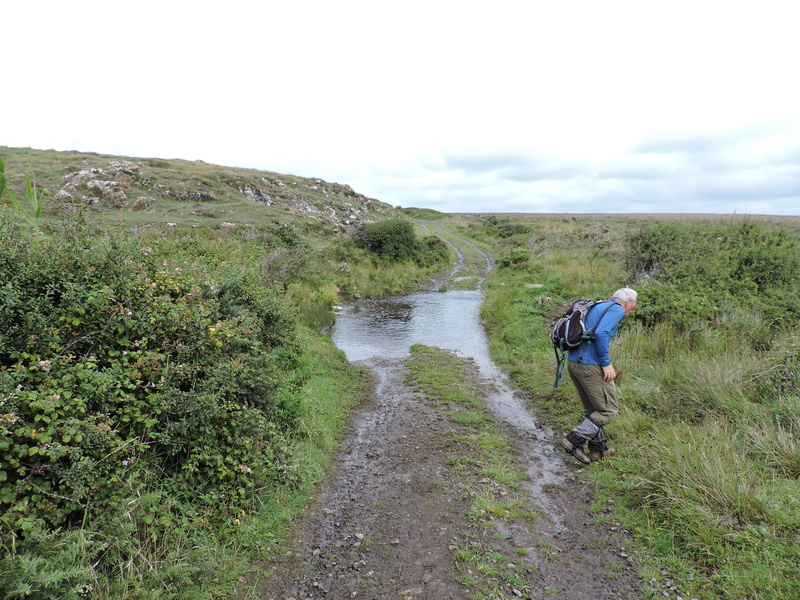 The walk from Lower Predannack Wollas Farm, (geese honking loudly in the barn) to the coast and then across the headland mostly consists of sloshing through puddles or skirting pools of water which looked too deep to slosh in. Sloshing is actually good fun if you’re wearing the right gear, which luckily we are today. The Water Mint is growing, appropriately, all along the route. 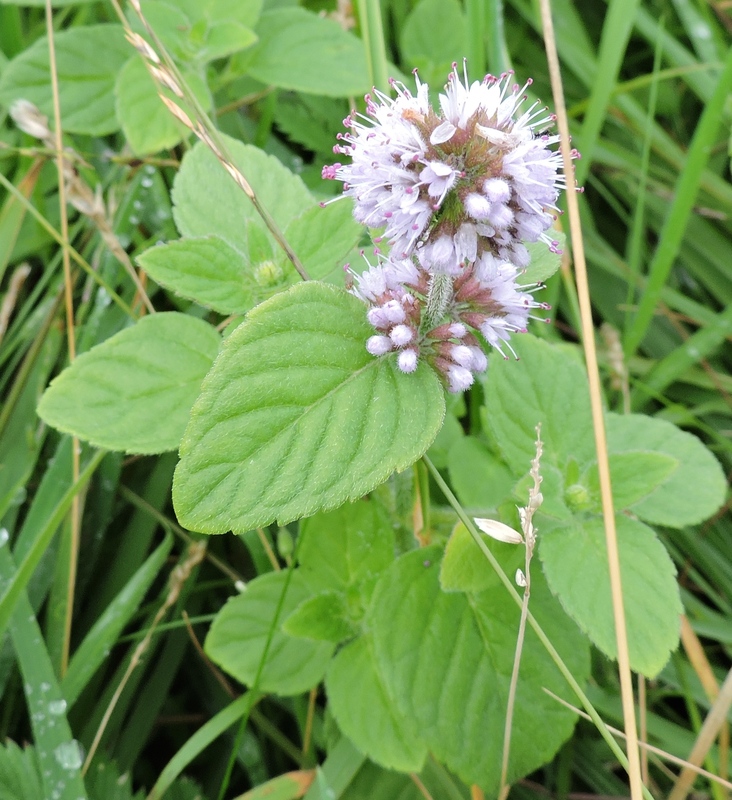 Did you know that the use of mint in cooking dates back to Roman times when they cultivated an aromatic plant believed to have been the water mint? 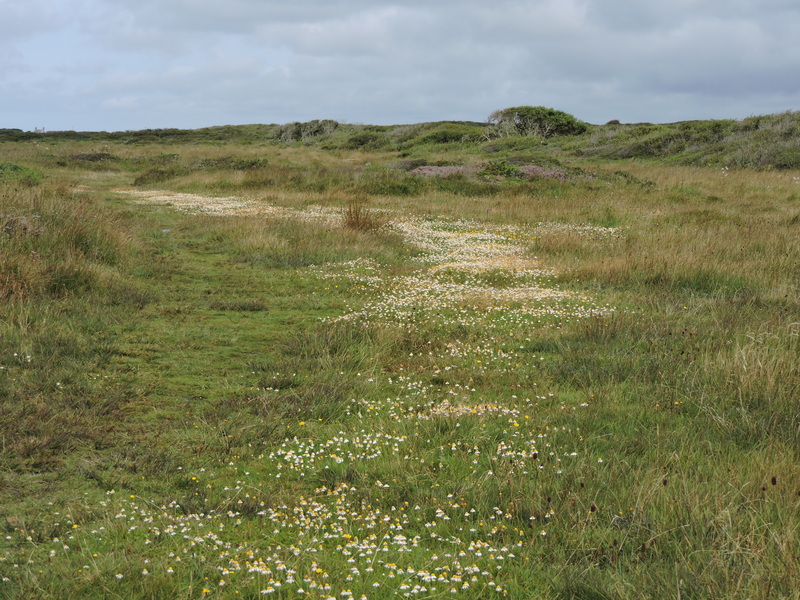 This is, according to The Reader’s Digest Wild Flower Book, the commonest of all the mints in the British Isles and was used as an early form of smelling salts and for many other medicinal purposes – especially in the treatment of earache and stomach upsets. 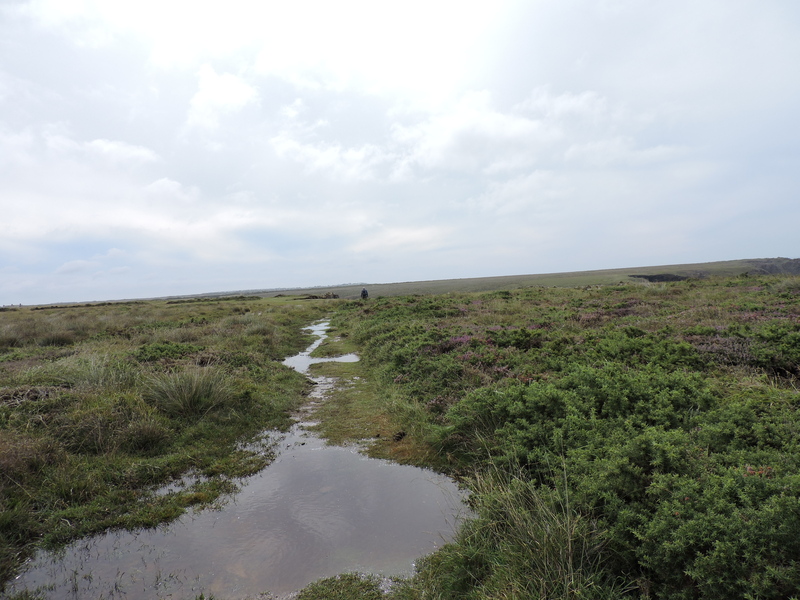 Anyway – here it is, marking our route across the soggy uplands of the Predannack Downs. 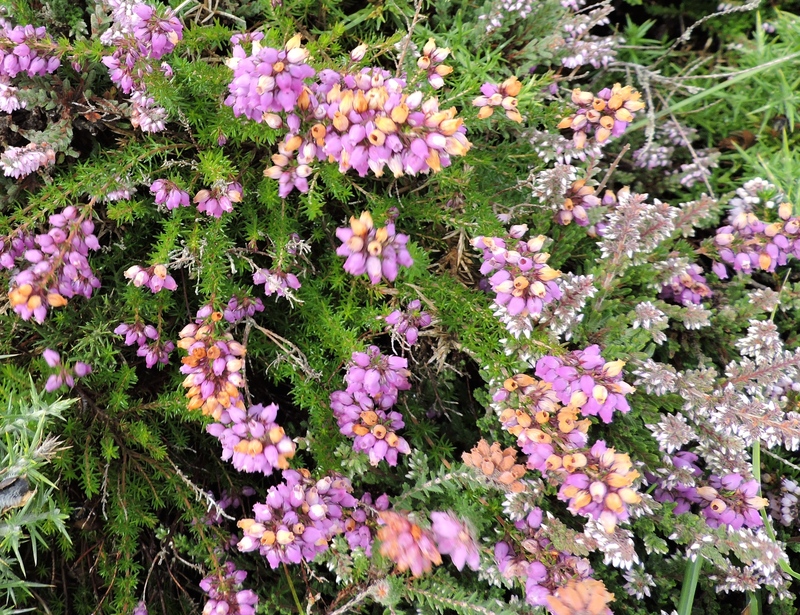 Dexter cattle wander the heathland here, playing a part in conserving and restoring grassland habitats. 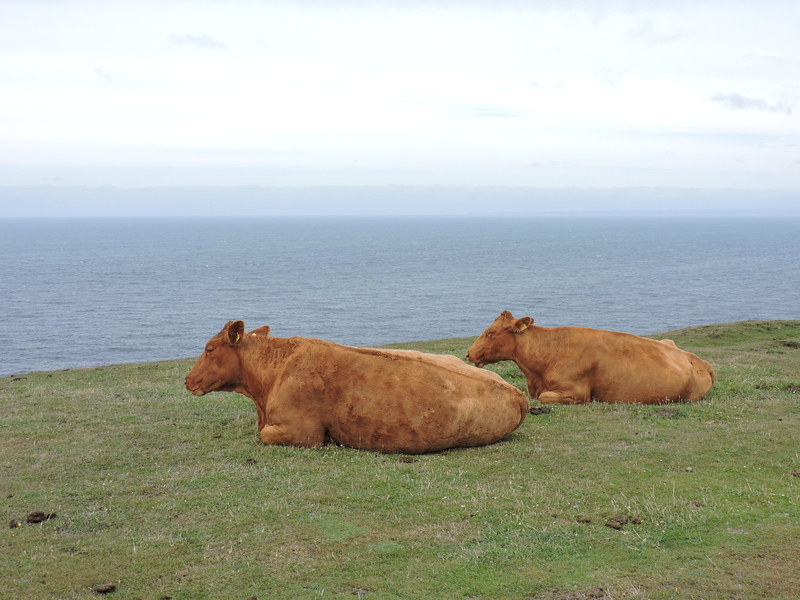 The National Trust say that these cattle are perfect for grazing in this area as they are not only hardy, but small hoofed which is ideal for craggier cliff tops. 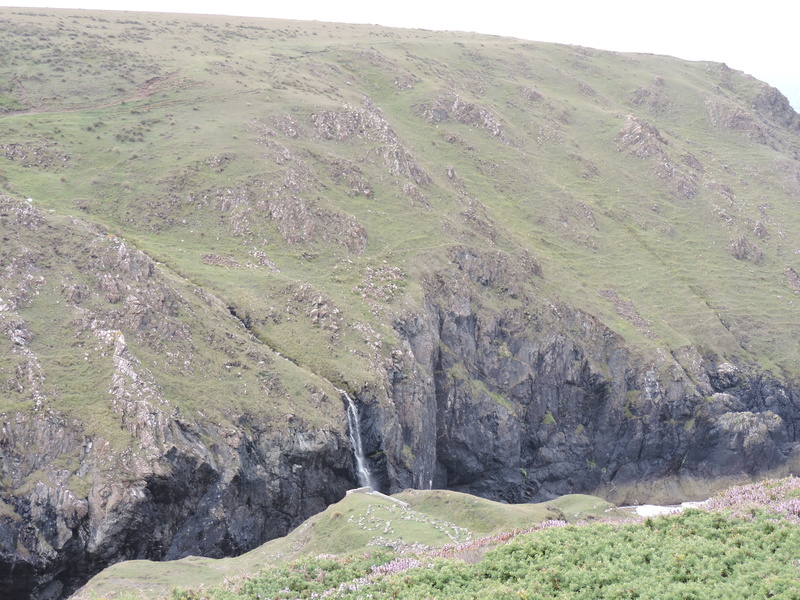 I have to admit though to being a little concerned about their closeness to the edge of the cliffs. How do they not wander off in the middle of the night and end up in the sea? 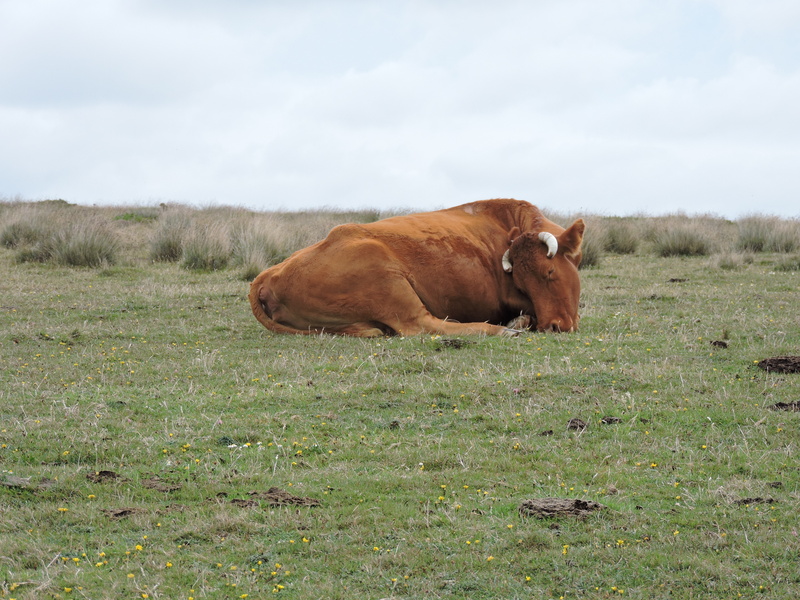 I’m sure this sleeping cow is just plain exhausted from having been up all night worrying whether her calf will wake up and wander over the edge! So close to the edge……it’s a long way down! 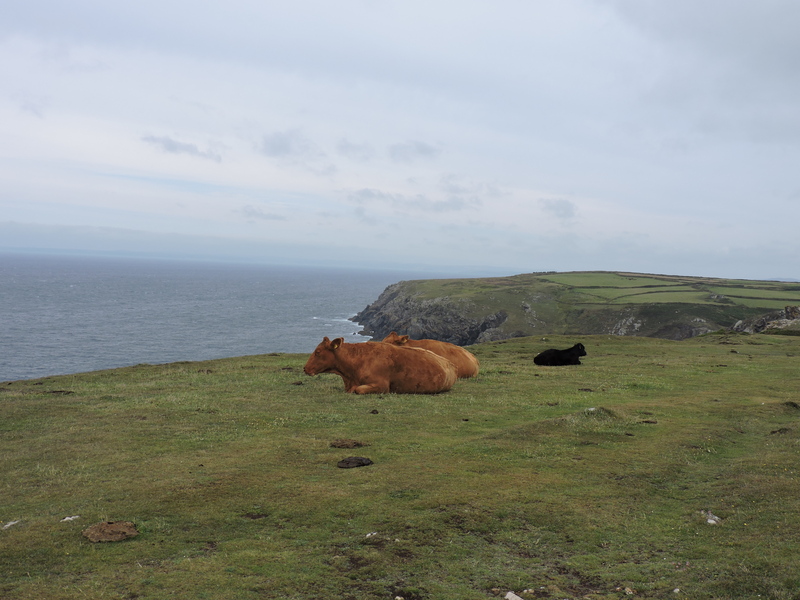 I’m surely not the only one worried about that little black calf…..
Yes…..that’s Mr RR in the far distance there – fed up with waiting for me again! 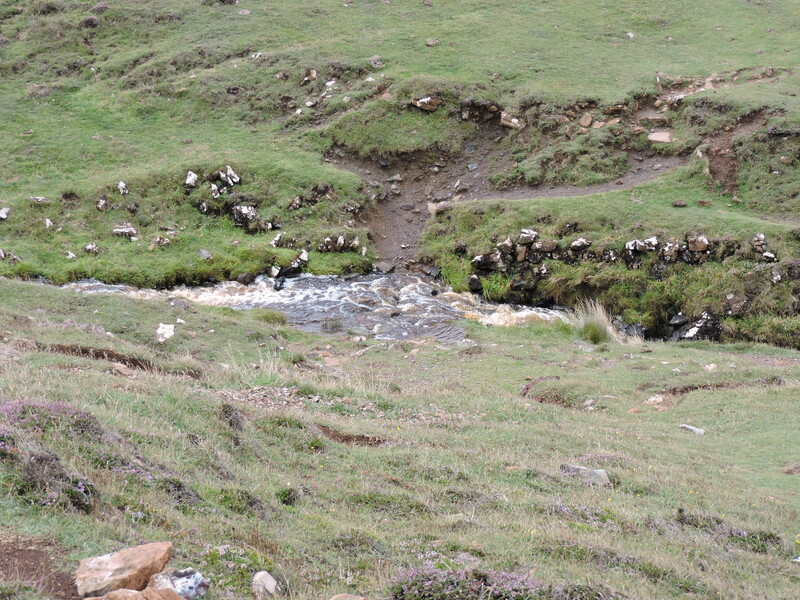 And, as we clamber down the slippery path, we see below that our usual stream crossing point has become a veritable torrent of running water! We carry on down regardless but need to take a little inland diversion so that we can hop across at a safer point, before climbing our way up the other side. At the top Mr RR spots a little bird and manages to capture a shot as I’m still recovering from my struggle upwards! 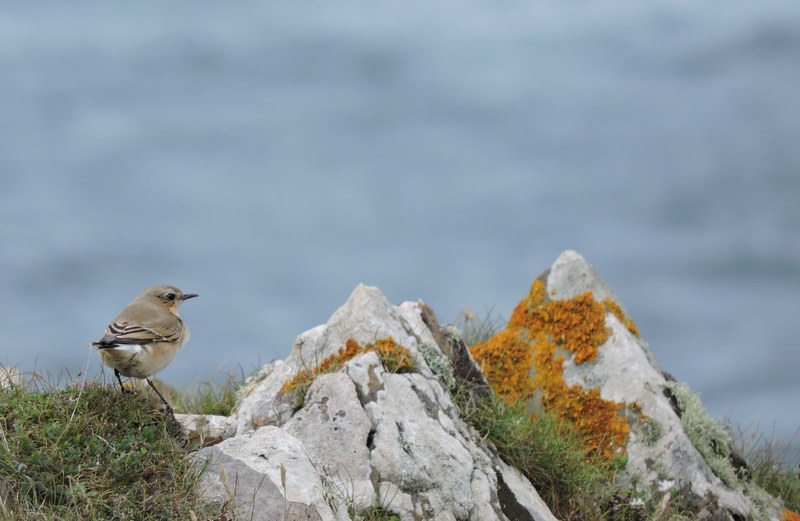 It’s a Wheatear – a female I think and a first for me. I haven’t seen this bird so close before. It’s name comes from ‘hwit‘ and ‘ores‘ – Anglo-Saxon words for ‘white’ and ‘rump’ which are its most noticeable features. 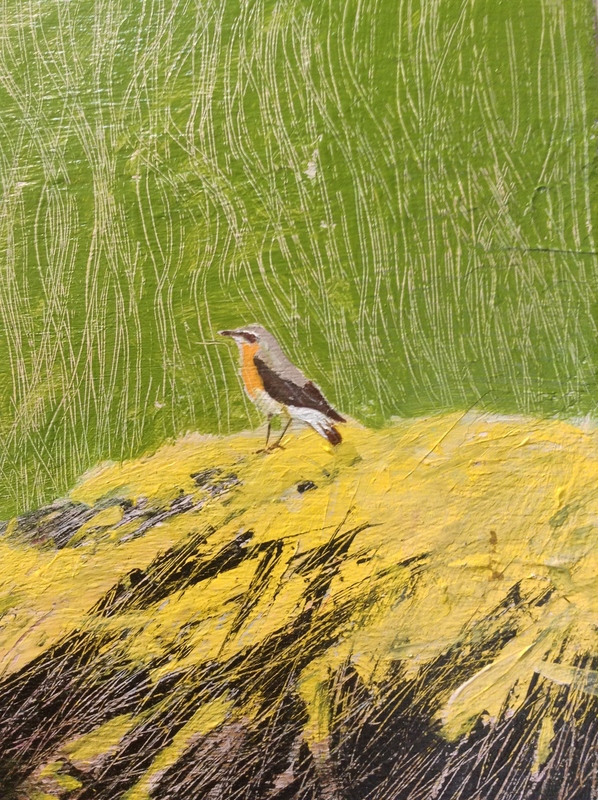 Seen mainly on heathland and around coastal areas, this little bird is a summer migrant, arriving in March or April and nesting in drystone walls or under large stones between April and July before heading off back to Africa in August for the winter – what a hectic lifestyle it’s chosen! 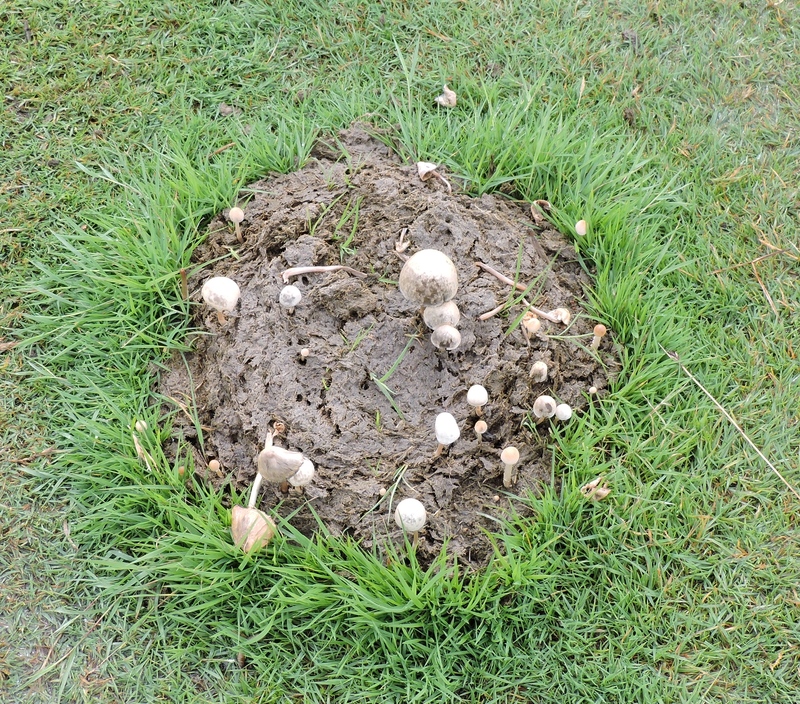 unsurprisingly as it’s so damp here, but we’re astonished to see a cow pat growing its own fungi! It looks like a little garden’s been planted up! 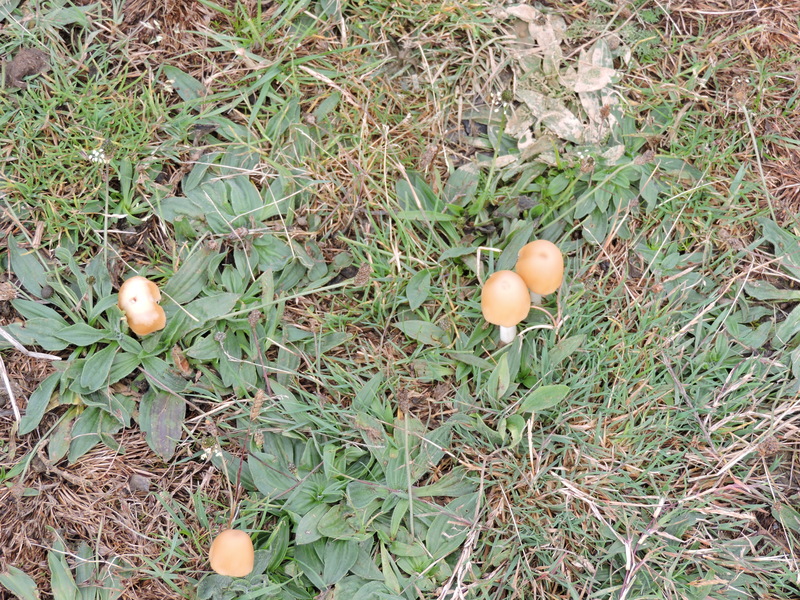 By the way, I refuse to get into the identification of mushrooms and toadstools here – I have enough problems with birds and flowers, and have no wish to be responsible for somebody’s experimenting with mushrooms thank you! 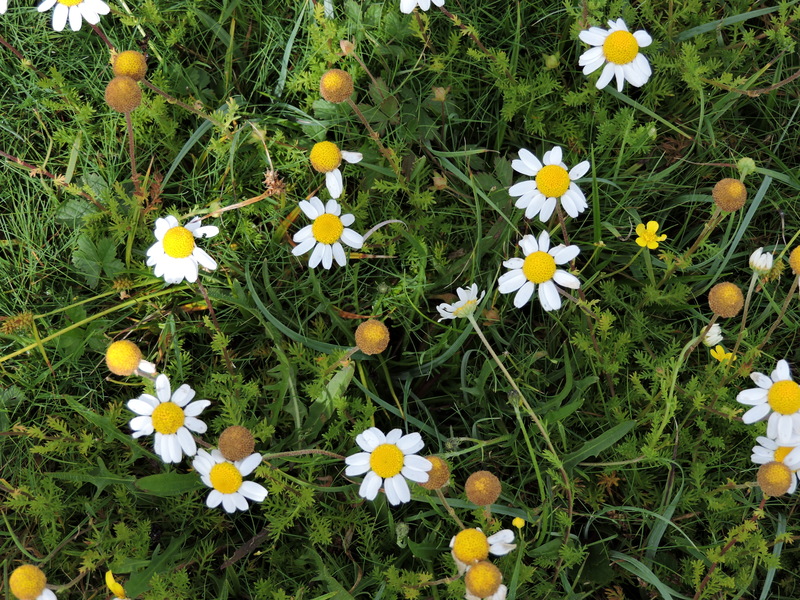 Scented Mayweed – also known as Wild Chamomile. 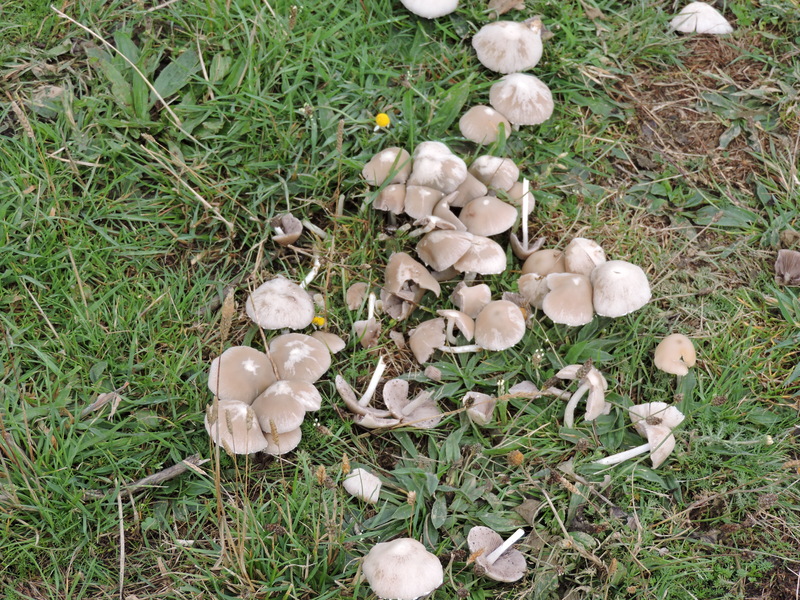 With a pronounced scent of apple, this flower can be picked in July and August and used for making tea – said to be a cure for indigestion and insomnia. The wind is rising now, and its blowing towards us, which is great for keeping the hair out of your eyes, but very hard work for walking! It’s getting wetter now as well, the ground always damp here, is saturated and the puddles and pools becoming harder to navigate around. No matter, most of them can be sloshed through with no problem. And at the ford, which we usually splash across without a second thought, someone has built a little wooden bridge across what is now a rushing stream. 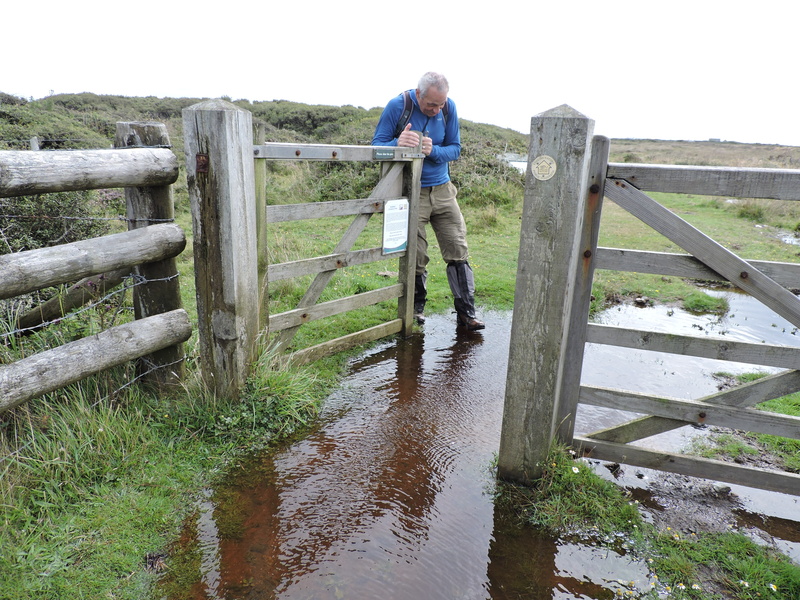 Trouble does occur though when, on reaching a farm gate, completely immersed in water, Mr RR does the gentlemanly thing and hops across the water to open the large gate which seems like a less wet route. 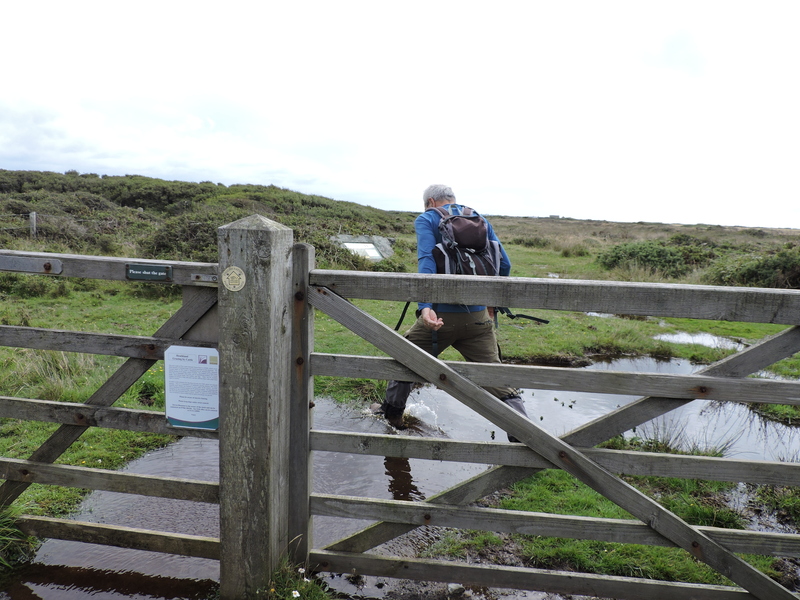 He walks backwards with the gate whilst I slosh my way through. 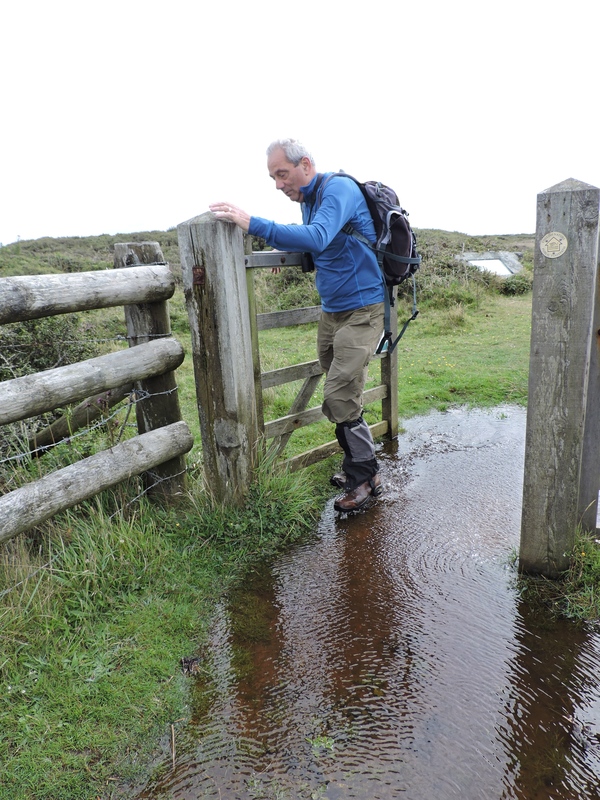 However, he is then stuck behind the gate on a hillock surrounded by knee deep water and can’t get around it without getting very wet. 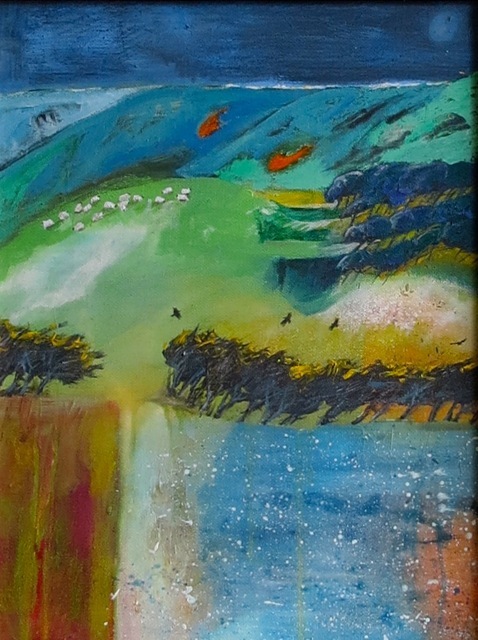 He finally has to push the large gate shut so that he can get off of his island, and manages to splish, splash and splosh his way through the side gate – it was all very funny from where I was standing – on the dry side! I did laugh…..although Mr RR may not have thought it so amusing. He managed though, without getting too wet..hahaha. 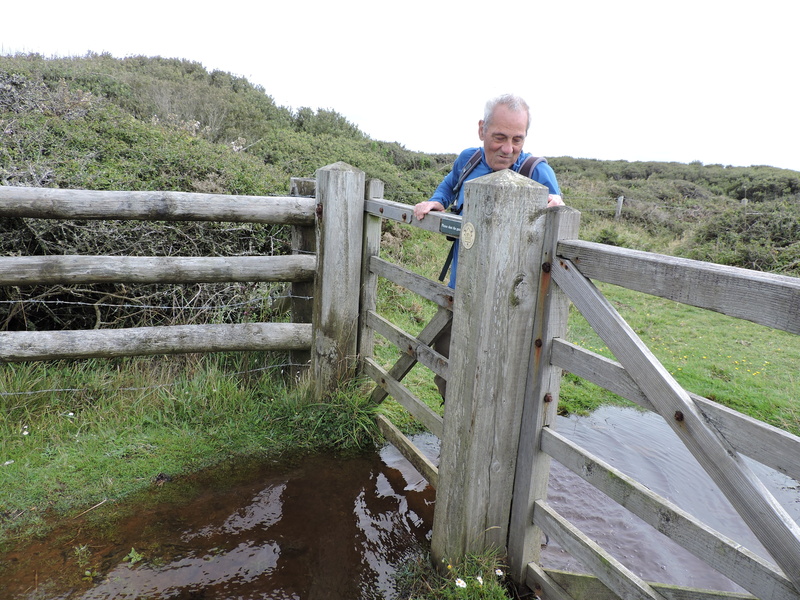 Plain sailing after this….except for the stony stile where I tried to descend without going down the very narrow stony steps and plonked down in very ungainly fashion on the wall ……Mr RR may have got his own back a bit there in the laughter stakes! Luckily he didn’t have the camera!